Every good book needs a dedication. For me as an author it's one of my favorite parts of writing. After all the long hours writing, editing and formatting there's one last thing to do and that's writing the dedication. For the Nova Trilogy I decided a good while back that each book will be dedicated to authors who have greatly supported me in my writing and who have helped me progress in my work. I dedicated book 1, NovaForge, to Ivan Amberlake, who has become so essential in my editing process and who, more important than that, is such a fantastic friend. Book 2, NovaSiege, is dedicated to... drumroll please... author Cara Goldthorpe. We met years ago on the author website Authonomy, quickly realizing that the realms of our fantasy books had similar names and that we both greatly enjoyed each other's works. Cara co-founds Breakwater Harbor Books with me and I cannot think of a better author to dedicate NovaSiege to. I hope she and all my readers enjoy the book! The dedication to her and a link to the book on Amazon is below! Have a vivid and wonderful day! This book is dedicated to Cara Goldthorpe, a fellow author who stood behind my work from early on and who has read, helped in editing and highly supported my books as they publish. She helped provide the confidence to delve into the published world and is a co-founder of Breakwater Harbor Books by my side. Goldthorpe is a brilliant author and I greatly look forward to her first published release! From Meridia and Meridisia to the beyond! Author Ivan Amberlake reviews NovaSiege! NovaSiege is book 2 in the Nova trilogy, and I must say I’ve been really enjoying this trilogy so far and can’t wait to read the next book in the series. It is set in the distant future on a planet where people’s minds are manipulated by the essences. The world-building is just amazing. As I’ve already mentioned in my review of NovaForge (book 1), the author has a gift for inventing new worlds teeming with monsters, which makes his series stand out. I loved spending more time with the main characters. With each page we get to know them better, and we can understand what makes them fight. It’s Faith and Hope. They play a crucial role in all of Scott Toney’s novels, including NovaSiege. NovaSiege is a well thought-out novel which you’ll never want to put down until the final page. I certainly look forward to reading Book 3 of the series. NovaSiege is white hot and just released in paperback! NovaSiege, book 2 in the NOVA Trilogy, has just released in paperback! Just off the presses! Get it while it's hot! The dark priest, Samuel, is dead, but at what cost? In a time of darkness the young boy, Bayne, has bonded with Samuel’s essence. The minds of all who connect with the essences are tested as an undefeatable evil reaches its tendrils through their minds. Beasts roam Solaris’ landscape, preying on its starving inhabitants. Can the remainder of the Julieth’s league overcome the voices within them and the beasts plaguing the land, or will they be devoured in their struggle? Is the boy Julieth once loved like a son forever lost? As the temptation of godhood, power and hate tempts all people bonded with essences, who will overcome the control and who will embrace what is whispered to them as destiny? An enemy hand opens as their final hope. Can it be trusted? NovaSiege - Julieth - An excerpt from the soon to be released novel! The character Julieth in the NOVA Trilogy is an intense, headstrong female character with vast feathered wings and a leaning towards the bow and arrow. She’s tough, and yet in a world that has been decimated by years of a corrupt humanity, she is the character with the most heart. She understands the need for battle, and yet struggles in her mind against it. The origin of the name Julieth has a long history for me. Each one of my books has a character in it that in some way came out of my poetry book, Dusk Crescence. In the NOVA Trilogy Julieth is that character. There was a character in Dusk Crescence named Julieth who was a winged woman. She had a different personality than this Julieth, but that is the name’s original usage in my books. When I created the name I was in High School, sitting in class looking at a friend of mine, Judy. I needed a name and I thought… Judith, Judie, Julie, Juliet. But Juliet is Shakespeare’s character’s name. Then I added an H. Julieth. So now you know where and how. Julieth is a key player in the NOVA Trilogy. Check out an excerpt below from NovaSiege involving her character. I take great pride in Julieth. NovaSiege releases Friday June 18th. NovaForge, book 1 in the trilogy, is currently FREE on Amazon in eBook and NovaSiege is available for eBook pre-order and also paperback. Have a wonderful day and thanks for reading! The wind sawed over Solaris’s arid land, howling like a tortured, dying creature being torn apart in the night. Julieth, though warmed by the heat of a crackling fire nearby, was chilled to the spine by the sound. It had been months since she last saw Ivanus and the others leaving Gest’s gates, venturing into the thankless expanse. Rumors grew by displaced citizens searching out Gest that Samuel killed more and more, amassing his forces. Bayne, Ivanus, they must all be dead. How do we stand against such evil? She turned a twig with a leaf on it in her hand, watching the moonlight refracting off its veins. A tree with white blooms thrashed in the harsh wind close by. So much life blooms around us and yet we can do nothing to clog the sea of blood coursing across our world. I feel it bludgeoning Gest’s gates, reaching for me. As she closed her eyes a deep chill crept over her, a sharp cold starting with her palms bracing the ground, and then seeping up her body. The wind tonight… it has never been so cold. But it was not the wind. Thick frost marked the earth, spreading and climbing the rust-walls nearby and the trunks of trees, coming from below. It ascended her flesh, its sparking white form glistening in the moonlight. Cracks slowly formed in the ice sheen, and then the ground moaned as a section of earth a distance from Julieth cracked in on itself and then fell into a dark void. Julieth opened her eyes while hearing shouts of terror, stripping her of near sleep. Shadows thrashed through her sight. An entire shack dropped through the earth, disappearing from her view. “Mother!” a girl shrieked. Ice flecked from Julieth’s body as she moved. “What is happening? Ineal! Help!” she shouted, running towards the screams. A sudden thrust of wind punched her wings, beating her flat to the earth. She breathed erratically, her arms punching through frozen soil as if it were a shell. The arms of a beast ripped through the earth below her, clawing at her form as the earth’s shell cracked away and they both fell into a dark void. “Ragoor!” Julieth screamed, panic surging through her as pain burned in her skull. The beast which had pulled her down climbed her body, clawing at her flesh and weighing her down as she beat her wings, trying to fly out of the darkness. Its talons reached around her back, shredding a wing and sending blood spattering. They dropped quickly and Julieth punched the beast’s rocklike hide, and then kicked it hard, somehow managing to separate it from her. Its bloodshot eyes stared hauntingly at her as its form disappeared in the black. Other shouts of Gest’s people pierced the air around her. She struggled frantically, her one usable wing beating hard, spinning her madly until her legs punched against the rock below, dislocating joints as the rest of her body smacked the surface. I met Scott Toney years ago while a member of the online writing platform, Authonomy, and I remember really liking his book, Eden Legacy. So, when I bumped into Scott a few months ago and found out he was up for an interview, I was really excited. Please stick around and meet Scott, musician, and faith-based author. Welcome, Scott! Can you start by telling us a little about yourself? I am a family man first and a dedicated friend. Those things and God are the most important things in my life. I am also a co-founder of the Independent Author Imprint, Breakwater Harbor Books (which I am very proud of), I have a degree in Journalism and Public Relations and am great lover of singing and the written word. I was trained in Journalism in college and also took courses in novel writing. I write in many different genres, including Christian, Sci-Fi, Fantasy, Romantic Suspense and Poetry. I am definitely thick skinned. Sometimes it is those harsh reviews that you learn the most from. You need to have your eyes open to criticism and also realize that sometimes people are just wrong but that we all have the right to our own opinions. I ask for honest criticism from my peers. What inspires your stories? What draws you to your preferred genre? The one Genre that runs through all of my books is Faith. In a book there is always the issue of something going wrong… and in that moment I always turn to faith and find that my characters do as well. Even when I begin writing without faith in mind, I find that by the end of the novel faith plays a crucial role. God flooded the earth to annihilate humanity’s sins. What if that sinful race didn’t die when floodwaters covered them but instead adapted to breathe water? Under the depths of the ocean one boy has raised himself, until the day when he meets a dark-skinned man with news that will change the lives of his civilization forever. Now he must save his people from another empire of water dwellers bent on enslaving the oceans and torturing his peaceful realm. Yet another question is posed as he learns that his people are descended from humans that lived on the land above the ocean; a people that were destroyed by floods made by the rage of God. If they have to, in order to escape, will they be able to breathe air and join whatever is left of the world above the waters? What would they find there? Is the mythological Noah still alive? 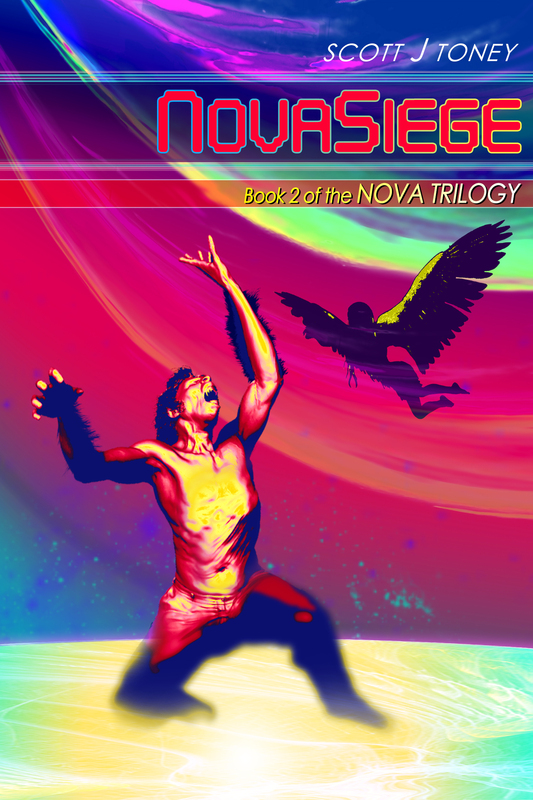 I’ll be publishing the second novel in my Nova Trilogy in June, NovaSiege. Can you tell us one (or two) quirky thing about yourself? Other hobbies besides writing? I’ve taken opera lessons, love leaving quarters in gumball machines for kids to find and am like a 90 year old retiree who is a kid at heart, or so my wife tells me. Did you go traditional or self-publish? Self Published, though I was approached two years ago by a traditional publisher to publish The Ark of Humanity with them and declined because I wanted to keep the novel with Breakwater Harbor Books. Advice to those looking to break into your genre? On marketing and selling? Write from your soul and be true to your mind and heart. I don’t know that your profits will rise with that strategy, but it is fulfilling. That and try many different strategies until you find the marketing strategy that works for you. Don’t get discouraged. If you throw enough bricks at a wall eventually one will break through. It’s been great having you on, Scott! All the best as you pursue your writing goals. Readers, please check out Scott’s links and books, as well as those affiliated with Breakwater Harbor Books! Have a great week, everyone! One of the most thrilling parts of writing a book, for me, is seeing what comes out of it. When you set out to write you always have the outline. You know basically where things will go, but what I love most are the characters that are created spur of the moment and then become huge to the story and plot. Enter Ragoor, a where-beast that entered NovaForge initially out of need to build intrigue in an early chapter. At that point in time I did not intend for him to be a were-beast and certainly did not intend on him becoming one of the top character players in NovaSiege, but here he is in book 2 leading a horde of were-beasts at Julieth's side. They are beasts when they are in the shadow and then when sunlight touches them they morph back to human form. This type of character is the most fun to write, because everything he does initially is new and un-plotted. As an author, I initially know everything that will happen, and them my mind goes (Wow! What about this!) and I run with that curve ball until I get another. I hope you enjoy Ragoor and all the were-beasts as much as I do. I'm looking forward to sharing NovaSiege with all my readers when it releases June 19th. The book's now available for eBook pre-order on Amazon! Below is a snippet with Ragoor. I hope you enjoy! Beady, moist eyes watched the winged woman intently in the moonlight as she landed and came toward the were-beast. It had followed her and her company since leaving Kaskal, always at a distance, waiting for its time. Its tongue lapped its mouth, saliva dripping from its maw. “The essence?” Julieth stepped back, her muscles tense. “Your companion is a thief.” The beast’s eyes watched her wildly, glimmering.